Joseph ((Matt Ono) delights in his multi-colored coat. 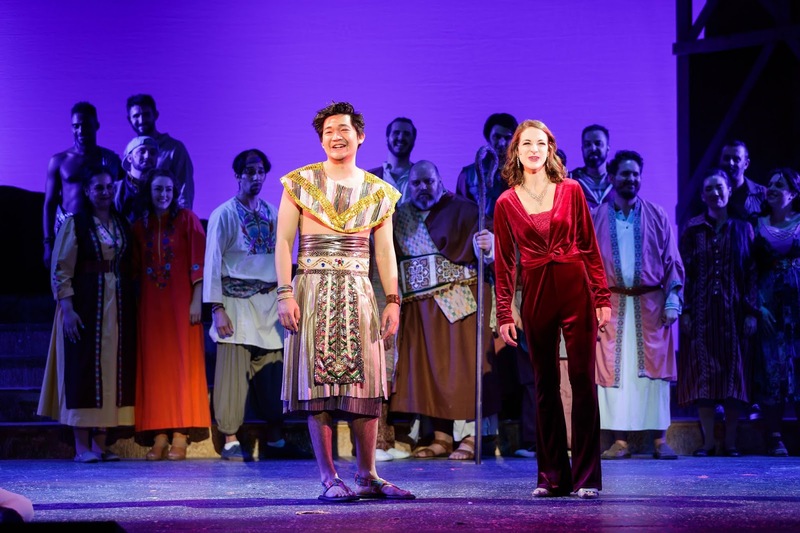 Broadway By the Bay’s “Joseph and the Amazing Technicolor Dreamcoat” blends all of its elements into a dream production. An early collaboration between composer Andrew Lloyd Webber and book writer-lyricist Tim Rice, it went through several iterations over several years, the latest in 1974. 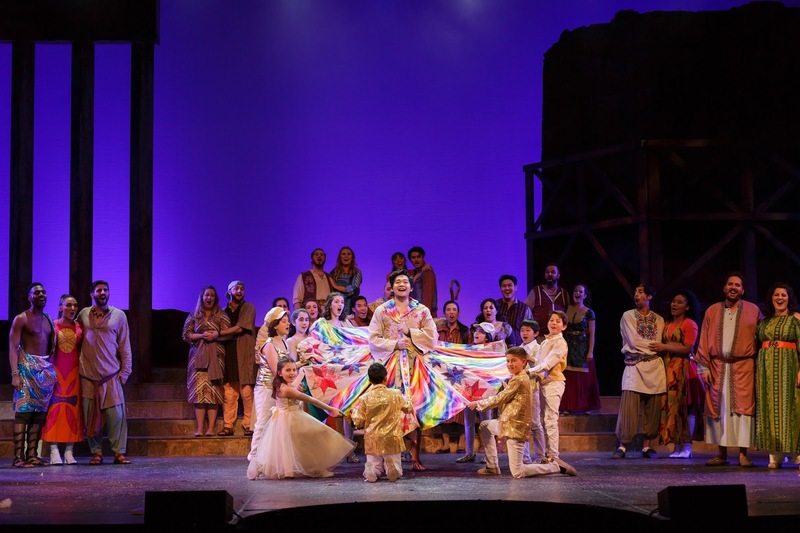 BBB’s production is anchored by Chelsey Ristaino as the Narrator, who begins telling the biblical story to 11 children. Joseph (Matt Ono), who had 11 brothers, was the favorite son of Jacob (Chris Fernandez). After Jacob gave Joseph the multi-colored coat, his jealous brothers sold him to some passing Egyptians, assuming he wouldn’t survive. Joseph wound up in prison in Egypt, but when word of his ability to interpret dreams reached the ruler, Potiphar (Nathan Temby), he soon became his second-in-command. Knowing that seven years of great harvests would be followed by seven lean years, Joseph made sure the Egyptians had enough stored to survive. In the meantime, Joseph’s family wasn’t so lucky. Therefore, the starving men went to Egypt in hopes of finding food. Most of the story is sung, but it’s clear and accessible thanks to excellent diction all around. The music varies in style from disco to rock (Manuel Caneri as Pharaoh impersonating Elvis Presley in “Song of the King”) to country western (“One More Angel in Heaven”) to calypso. 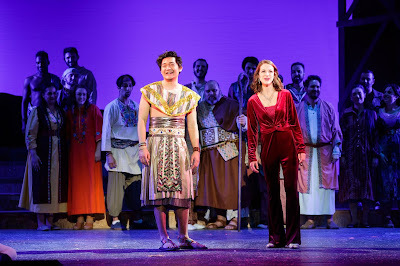 Chelsey Ristaino as the Narrator, with Matt Ono as Joseph, anchors the show. All of the principals do well, especially Ristaino as the Narrator. She has a crystal clear voice and a strong stage presence. The men’s, women’s and children’s choruses are outstanding, thanks to music director Alicia Jeffrey and vocal director Daniel Lloyd Pias. Director Stephanie Renee Maysonave keeps everyone involved, maintains the right pace and inserts some amusing stage business. Adding to the enjoyment is the inventive choreography of Christina Lazo. Costumes by Bethany Deal are spectacular, as is the lighting by Eric Johnson. The fluid set is by Kuo-Hao Lo with an effective sound design by Zak Stamps. During intermission of the March 17 matinee, a 6½ -year-old girl was so inspired by the show that she was dancing on a landing to the balcony while her mother waited for the restroom. Yes, it’s that kind of show, one that deserves its prolonged standing ovation. Running about two hours with an intermission, “Joseph and the Amazing Technicolor Dreamcoat” will continue through March 31 at the Fox Theater, 2215 Broadway St., Redwood City. For tickets and information, call (650) 579-5565 or visit www.broadwaybythebay.org.